For photos and tourist information, use the Onna-son trip planner. Singapore, Singapore to Onna-son is an approximately 6.5-hour combination of flight and taxi. Due to the time zone difference, you'll lose 1 hour traveling from Singapore to Onna-son. Traveling from Singapore in June, expect nights in Onna-son to be about the same, around 29°C, while days are a bit cooler, around 34°C. Wrap up your sightseeing on the 3rd (Sun) early enough to travel to Taketomicho Iriomote-jima. Kick off your visit on the 3rd (Sun): skim along the rocks with a canyoning and rapelling tour. 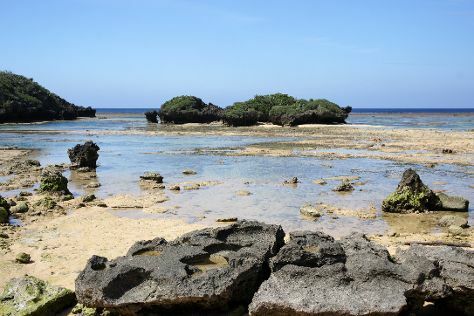 Here are some ideas for day two: admire the sheer force of Pinaisara Falls, then step off the mainland to explore Iriomote Island, and then look for all kinds of wild species at Funauki Village. To see ratings, other places to visit, reviews, and other tourist information, you can read our Taketomicho Iriomote-jima trip itinerary planner . Do a combination of taxi, flight, and ferry from Onna-son to Taketomicho Iriomote-jima in 4 hours. In June, daytime highs in Taketomicho Iriomote-jima are 37°C, while nighttime lows are 32°C. You'll have a few hours on the 5th (Tue) to wrap things up before traveling to Kyoto. On the 6th (Wed), contemplate in the serene atmosphere at Toji, then steep yourself in history at Fushimi Inari-taisha Shrine, and then take some stellar pictures from Kiyomizu-dera Temple. Get ready for a full day of sightseeing on the 7th (Thu): take in the spiritual surroundings of Kinkaku-ji, then take in the spiritual surroundings of Ryoanji Temple, then explore the historical opulence of Nijo-jo Castle, and finally take in the spiritual surroundings of Sanjusangendo Temple. To see photos, where to stay, ratings, and other tourist information, read Kyoto tour planner . Traveling by combination of ferry, flight, and train from Taketomicho Iriomote-jima to Kyoto takes 7.5 hours. Alternatively, you can do a combination of ferry, flight, and train. Plan for slightly colder temperatures traveling from Taketomicho Iriomote-jima in June, with highs in Kyoto at 32°C and lows at 22°C. Finish your sightseeing early on the 8th (Fri) to allow enough time to take a train to Tokyo. 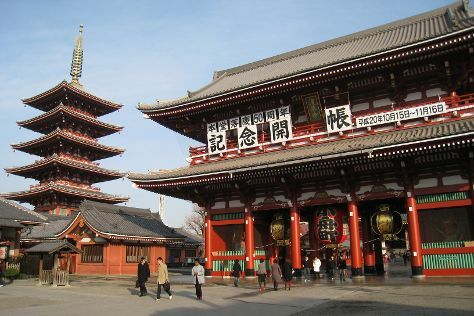 Start off your visit on the 8th (Fri): get a sense of history and politics at Tokyo Metropolitan Government Buildings, take in the spiritual surroundings of Senso-ji Temple, and then admire the masterpieces at Tokyo National Museum. To find traveler tips, reviews, maps, and other tourist information, read our Tokyo holiday app . Take a train from Kyoto to Tokyo in 3 hours. Alternatively, you can do a combination of train and flight; or drive. In June, daytime highs in Tokyo are 30°C, while nighttime lows are 22°C. On the 9th (Sat), wrap the sightseeing up by early afternoon so you can travel back home.